Ever Wonder How Babies Fit in the Womb? Here's How it Looks. The newborn photos you have to see. It's pretty crazy if you really stop to think about it: Your baby spends your entire pregnancy nestled inside your womb, and while your body accommodates to support this, it's still hard to believe that you're growing an entire person in there. But Marry Fermont is on hand to make it all a bit easier to visualize. 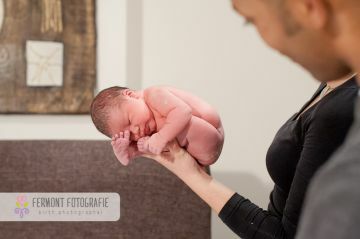 The Netherlands-based birth photographer does her best to capture babies in their 'womb positions' for her clients. 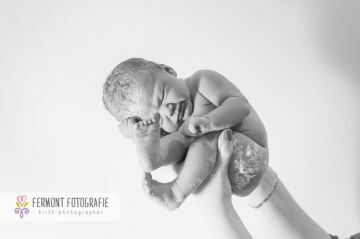 "It's so hard to imagine that this perfect little human being was inside you," the Fermont Fotografie owner, who also teaches birth photography workshops, tells TODAY. "To actually see how your baby was positioned in you is just a little magic. The photos are simple and pure." The photos Fermont produces are absolutely adorable. In some, the infants are bent so far into themselves, they appear to be folded in half. She manages to capture them in this very specific position: Head down, feet flexed, torsos touching legs. Want to know how Fermont's passion for these special shots was born? It actually happened by accident when she was shooting her very first live birth. The midwife helping with that particular birth showed the parents how their baby looked in the womb, and Fermont fell in love with that visual so much that it's become her specialty. Now, a lot of her clients request this trademark shot, and according to Fermont, mothers love the experience of knowing exactly how their children looked before they made their big entrance into the world. Fermont loves requesting that the fathers hold their babies while they're in this position as well. "It makes it just a little more special if the dad does it," she said. "After nine months, his child fits exactly in his hand like it was in the belly. There's nothing more special, if you ask me." The infants love it too: Fermont said they feel as comfortable in that position as you'd expect, considering they spent nine months like that. With that being said, the window is fleeting: Babies quickly lose their abilities to fold themselves into womb position. "It's a really short moment in life and so precious," Fermont said.